Dr. A. K. Shiva Kumar is a development economist and Adviser to UNICEF, India. He is also Visiting Professor at the Indian School of Business in Hyderabad and teaches economics and public policy at Harvard’s Kennedy School of Government. He works on issues of poverty, health, nutrition, basic education, women’s right and children’s rights. He is closely involved with development evaluation and is a founding member of the International Development Evaluation Association. 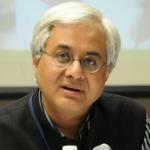 He has been a regular contributor to UNDP’s Human Development Reports and National Human Development Reports. He works closely with several non-governmental organizations engaged in the promotion of health, human rights and environment. He did his M.A. in Economics from Bangalore University and his Post Graduate Diploma in Management from Indian Institute of Management, Ahmedabad. He also has a Masters in Public Administration and a PhD in Political Economy and Government, both from Harvard University.